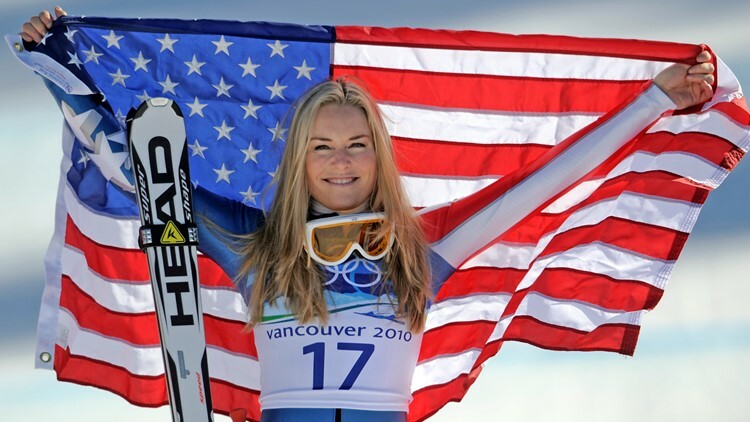 Vonn's impressive resume: three Olympic medals, including downhill gold at the 2010 Vancouver Games. Four overall World Cup titles. And 82 World Cup wins, leaving her four behind the all-time mark held by Ingemar Stenmark of Sweden. ÅRE, Sweden — Lindsey Vonn has won the bronze medal in downhill in the final race of her career. Fog and wind forced organizers to shorten the women's downhill course earlier, moving the start down to the second reserve start. The later start was favorable for Vonn, as with fewer gates to navigate, she didn't have to put as much strain on both of her surgically repaired knees. But now, conceding her body is "broken beyond repair," Vonn is nearing the finish line for the final time. The woman who won more World Cup races than any other female is calling it quits at 34. On Friday, she said she'll retire after the world championships this month. "She's accomplished so many things and has overcome so much adversity in her life, with her injuries, and comebacks, and setbacks and comebacks," U.S. Ski and Snowboard CEO Tiger Shaw said in a telephone interview with The Associated Press. "Very few people can focus and train as hard as she does. We're all in awe of what she's accomplished in her career." Vonn's original plan was to step away in December, after one final charge down the course in Lake Louise, Alberta — a course she won on so often it's now named in her honor. She was forced to move up her retirement due to persistent pain in both knees, which she fully realized after failing to finish a race in Cortina d'Ampezzo , Italy, last month. Now, she's down to her last competition..
That's it. That's all her knees have left. "My body is broken beyond repair and it isn't letting me have the final season I dreamed of," Vonn wrote on Instagram . "My body is screaming at me to STOP and it's time for me to listen. "It's been an emotional 2 weeks making the hardest decision of my life," she wrote, "but I have accepted that I cannot continue ski racing." Her off-the-slopes portfolio includes: Appearing in the pages of everything from Vogue to the Sports Illustrated swimsuit issue, earning sponsorship deals with companies such as Red Bull, meeting actors like Dwayne Johnson and even being an extra on one of her favorite shows, "Law & Order." The spotlight only increased when she dated golfer Tiger Woods. She's now seeing Nashville Predators defenseman P.K. Subban . She's big on social media, with 1.6 million Instagram followers. A recent post from Vonn was cryptic in nature and yet all-too-insightful as she quoted the French philosopher Voltaire: "Each player must accept the cards life deals him or her: but once they are in hand, he or she alone must decide how to play the cards in order to win the game." Vonn's right knee is permanently damaged from previous crashes. She has torn ACLs, suffered fractures near her left knee, broke her ankle, sliced her right thumb and had several concussions — to name a few. She's limited to about three runs per day, and her body just can't handle the workload of other skiers. Her first World Cup start was Nov. 18, 2000, in a slalom race in Park City, Utah, and she didn't qualify for the second run. She was Lindsey Kildow then, before changing her name to Vonn after marrying her now ex-husband and ex-coach, Thomas. As for how she will be remembered , that's simple for U.S. coach Paul Kristofic: Her comebacks. "That never-give-up attitude is something that everyone can take away from," Kristofic said. "She has created that character and lived it. Those are life lessons that everybody can take. Give it your all and never give up. That's a very strong legacy."